This week I am doing something a little different. I was lucky enough to be sent a sampler of some upcoming pre-release samples from Ortega Cigar Company’s Wild Bunch Series. As I stated, our friend Eddie Ortega sent me one of each of his first three releases in the Wild Bunch Series. These are pre-release samples and Eddie actually told me they were pretty close to final, if not final. That being said, I am just going to give them brief write ups on my general thoughts on each blend with any specifics I know. I also paired each one of these cigars with water. Usually I’d have some awesome beer or port but since I am only giving my thoughts on a single cigar I wanted to keep my pallet as clean as possible. 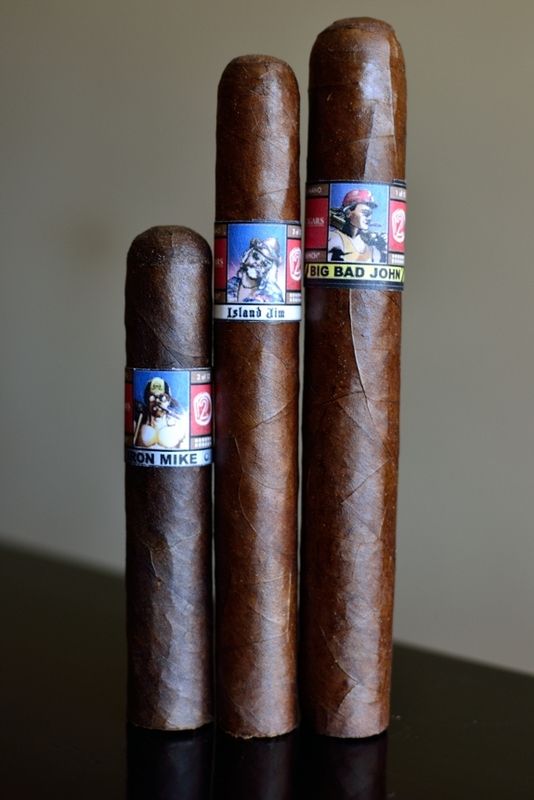 Also keep in mind that the bands on these cigars are just prototypes printed via laser printer. I would expect the design on the final product to be very similar if not identical to what they are on these samples. “During my time in the cigar industry, I’ve come to know lots of great interesting characters in the industry. I’ve found certain characters so interesting, that I decided to create a series called “Wild Bunch”. This series will consist of 12 characters, each of them with a unique flavor and size profile, no two will be alike. The series will consist of a limited number of boxes 500-1000, the number of boxes produced will be based on the blend selected for the character, I want to use out of the ordinary material, specially wrappers, and I know that some of the selected wrappers I have chosen are in very limited supply. Prelight: This baby is OILY! The wrapper on the Big Bad John is very silky smooth and just screams oil. This cigar gives off so much shine it almost looks like fake plastic. The wrapper is a nice medium brown and very consistent. There are quite a few very flat veins running through this very thick body up to the huge, round, triple cap. This cigar is heavy as hell and firm as a rock giving absolutely no way as I squeezed it. There are no soft spots and the construction is flawless. The wrapper lets loose a very strong, sweet cedar aroma while the foot gives off a strange gingerbreadesque aroma. 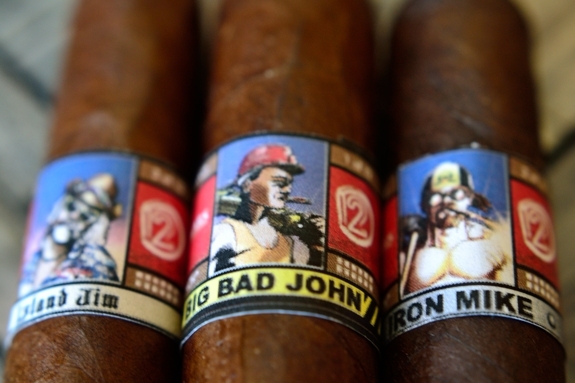 Flavors: The Big Bad John gave off very strong, bold tobacco and cedar flavors from the cold draw. 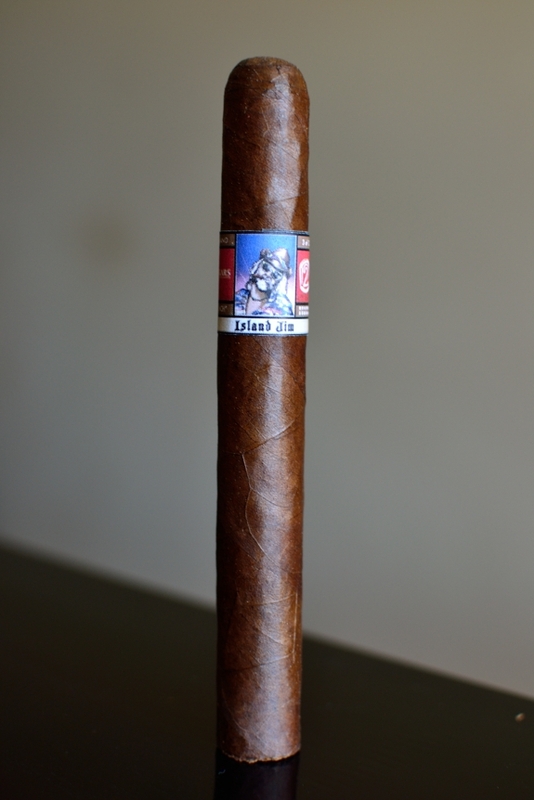 The Cigar started out with some nice spice, bold tobacco, black pepper, leather, and a strange meaty type flavor. I am also getting a neat saltiness from the wrapper onto my lips. As I smoked on some nice bittersweet chocolate began to make it’s way into the mix as well as some more natural, earth flavors. The Black pepper, while it wasn’t strong, stuck around almost all the way though the cigar and gave nice support for the sweeter flavors in the experience. The cigar finished smooth with lots of body as the bold tobacco and cedar really ramped up towards the end. Burn/Draw: Razor sharp, flawless burn the entire way though with a semi-flaky, light and dark grey ash. The draw is perfect. I am always worried about loose draws when it comes to larger ring gauges, but this one was spot on pumping out tons of thick smoke with every puff. Thoughts: I’ll be the first to admit that I don’t like large ring gauges on my cigar. That being said, there really are some blends out there that benefit from the larger formats (remember Quesada’s Oktoberfest Uber?). I really think this blend does very well in this size as I really enjoyed it. The filler flavors really got to showcase their strong, bold, yet sweet characteristics with a nice cedar blanket from the wrapper. This cigar is full bodied and full strength through and through. It’s strong, and flavorful. Be ready for it. The construction was flawless and the burn and draw were perfect the entire 2 hours it took to take this cigar down. While I enjoyed this cigar, I’d still love to see what the experience would be in a smaller format. Prelight: While the main story on the Big Bad John was the oil, the Iron Mike boasts one of the toothiest wrapper I have every come across. Running your fingers down this cigar feels like sandpaper. The wrapper itself is very hard and thick and consistently dark brown. This cigar too, is very firm and gave very little when I squeezed it between my fingers. There was almost not veins running up the slender body up to the round triple cap. It was hard to even tell this cigar was triple capped due to how toothy the wrapper was. It’s seamless. The wrapper really doesn’t give off much more than a slight tobacco aroma while the foot of the cigar lets loose a ton of spice and brown sugar. Flavors: WOW. Pepper bomb right off the bat. And it didn’t just show for a bit and then fade off. The pepper stuck around as a main component in the experience almost the entire time. 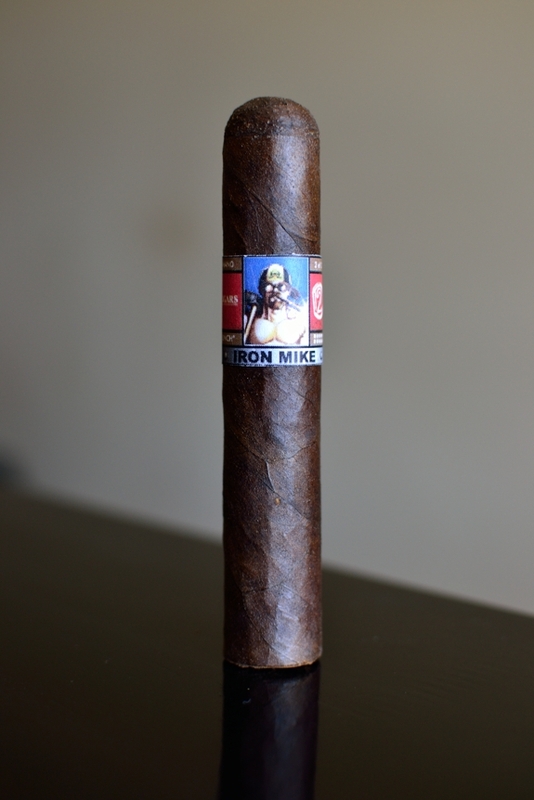 Outside of the pepper the Iron Mike boasts some very sweet tobacco, espresso, cherry, and a dark wood. Halfway through the pepper started to fade a bit and the cherry and espresso ramped up before finishing off smooth. Burn/Draw: The burn was a bit wide and rigid, but it burned cleaner as the experience went on. The ash was semi-flaky but held solid for well over an inch before giving way. I didn’t have to touch up or relight at all. 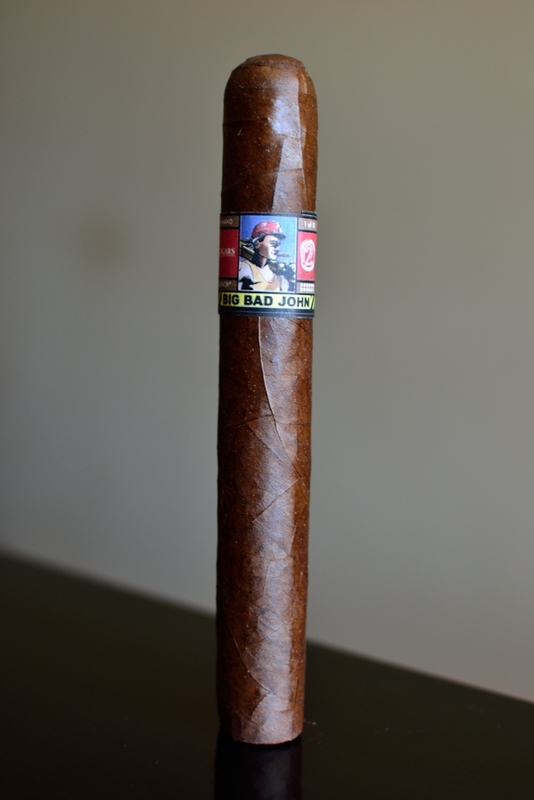 Thoughts: This cigar really starts off with a bang. It’s full-flavor, full-strength at it’s finest. Eddie actually called me a wimpy for saying that too. But this cigar woke me up! This is a great cigar if you like flavor bombs with lots of pepper as well as a complex experience. Prelight: It’s interesting to see that texture on the wrapper on the Island Jim is a mash up of both the Big Bad John and the Iron mike sporting a toothy, and oily texture. The Island Jim is the lightest in color out of the bunch showcasing a medium to light brown color. This cigar has a few larger veins and the color seems to be a darker brown with bits of orange surrounding these areas. While the other two cigars were extremely firm to the touch the Island Jim seems to be a bit more soft. The construction is still spot-on but the cigar itself has a little more give in it, especially around the foot. Again, this cigar is polished off with another round, triple cap. The wrapper gives off nothing more than a subtle cedar aroma while the foot of the cigar remains modest only allowing hints of spice and tobacco to show through. Flavors: The flavor wasn’t as bold, sweet, or strong as the other two. Usually those are the characteristics I look for in a cigar but this is another example of medium bodied done right. Lots of up front cedar and black pepper, light leather, smooth tobacco, ginger, and some neat clove hints here and there. Burn/Draw: Right off the bat this cigar burned razor sharp and perfectly clean leaving behind a very tightly compacted, thick ash. The ash actually held on for almost two inches before giving way. Thoughts: Let me spoil the surprise by starting off saying that this was probably my favorite cigar out of the bunch. This cigar was incredibly smooth and creamy all the way down to the nub without ever being too mild. The smaller ring gauge really let the flavor from the wrapper come out. In all honesty, this is one of my favorite formats as well. Brownie points go out to modeling this blend after Jim. In case you didn’t know, that dude’s an awesome badass. WOW!…great feedback Tony. Glad you enjoyed them man. Great cigars dude! Keep it up! Tony, loved the reviews. Always have a great amount of respect for your thoughts on cigars and this just really confirms what I found with these blends. Thank you! I agree 100%. Well, with the Eddie part. I was a huge fan of EO and I am glad to see he still hasn’t lost his touch. Great reviews Tony, I’ve got to talk to my guy and see if he can get some of these for me. They look very exciting. Thanks for sticking up for Daniel and the rest of us Maple Syrup lovers. Tell czerbe, it’s the sweetness that make the world a better place, get some!! What, no Texas Tony vitola? Sounds like a great series. Great review Tony! I hope I get to try these soon. Good review Tony, I think I might have to pass on those first two, sounds like strong cigars, the third one sounds more like me.